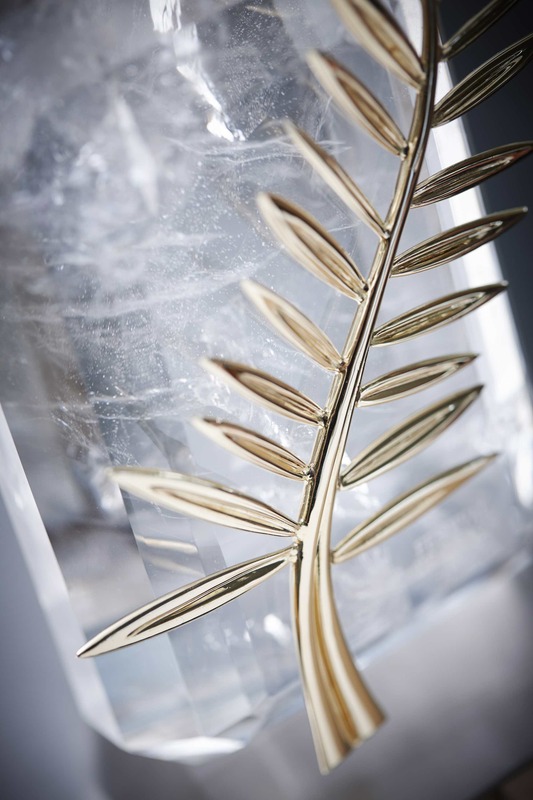 It was 1998 when Chopard became an official partner of the Cannes Film Festival, re-designing its top prize – the prestigious Palme d’or trophy – in the process. Twenty years on, Chopard completed another first when it designed and produced every single trophy presented at the 2018 Cannes Film Festival, a testimony to the maison’s commitment to sustainable luxury. Adding to this incredible feat, Chopard continued a tradition it began in 2007 by creating a number of new jewelry pieces equivalent to the edition number of the festival. Stemming from her boundless imagination and from peerless mastery of diverse skills within Chopard’s workshops, Artistic Director and co-President Caroline Scheufele this year created a complete collection of 71 pieces dedicated to the world’s greatest actresses and their red carpet appearances. High Life features its four standout pieces. Inspired by the costumes and traditional skills of the people on the Mongolian Plateau, the feather necklace is one of the star pieces in the 2018 Red Carpet collection. 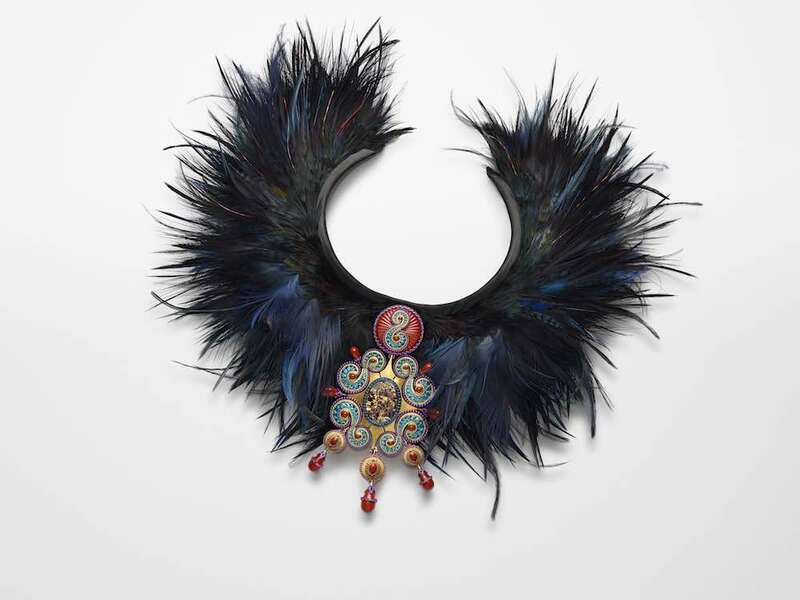 It is composed of a sculpted gold cameo adorned with volutes of blue apatites, violet garnets and red jasper on a necklace graced with rooster, grey heron, ostrich and black pheasant feathers. The resulting shimmering work of art, created in cooperation with feather artist Nelly Saunier, draws upon the mastery cultivated within Chopard’s Haute Joaillerie ateliers, the largest in Switzerland and home to more than 45 specialized artisans. 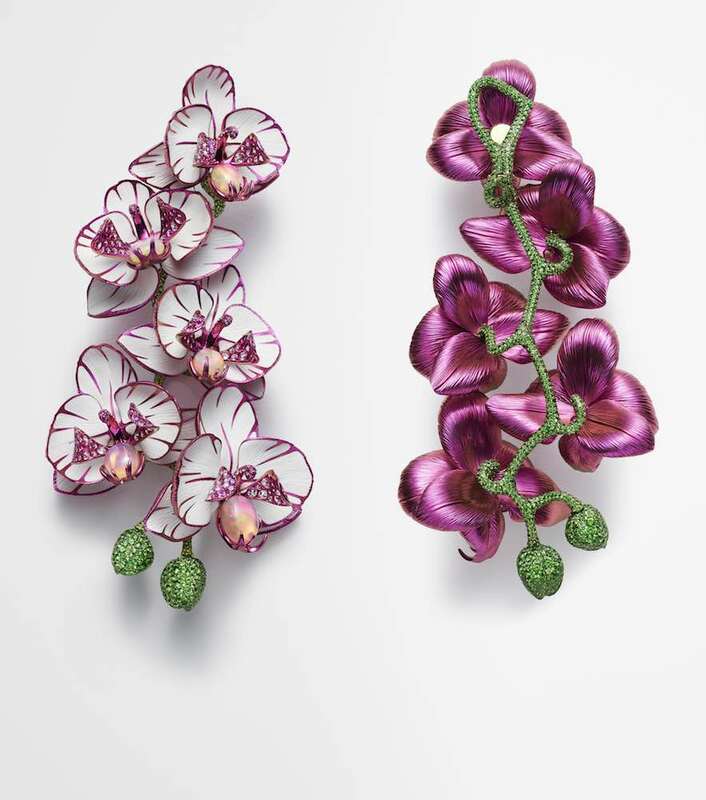 With these two new pairs of earrings, Caroline Scheufele has sprinkled the Chopard workshops with beautiful and precious orchid blooms. The gold stem and green buds showcase stunning gem setting virtuosity, with more than 4,800 tsavolites patiently set on this slender stalk just a few millimeters thick. On the first white and pink version of these creations, the petals are set with pink sapphires surrounded by tinted titanium sepals coated with a fine layer of white ceramic. The second pair is graced with blooming purple titanium flowers entirely set with yellow sapphires and garnets. The set of 17 “no oil” emeralds is a rare gift from the earth, as nature rarely gives rise to so many gems in such closely matching colors. 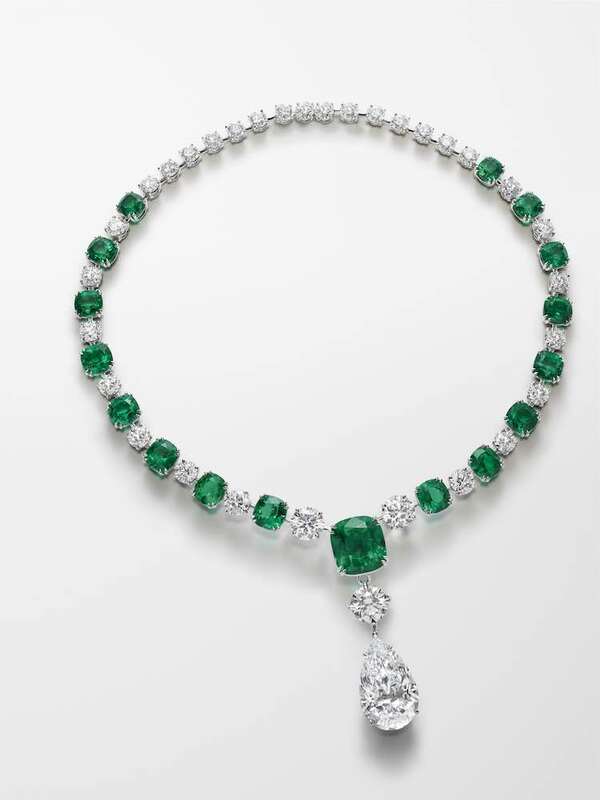 To enhance their exceptional beauty, Caroline Scheufele opted for a classic and timeless necklace characterized by elegant simplicity, featuring a precious circle of alternating emeralds and diamonds tapering into two gracefully attached magnificent D-flawless diamonds – of which the largest pear-shaped one weighs over 20 carats. Slender matching earrings add the perfect finishing touch to this adornment worthy of the most splendid surroundings. 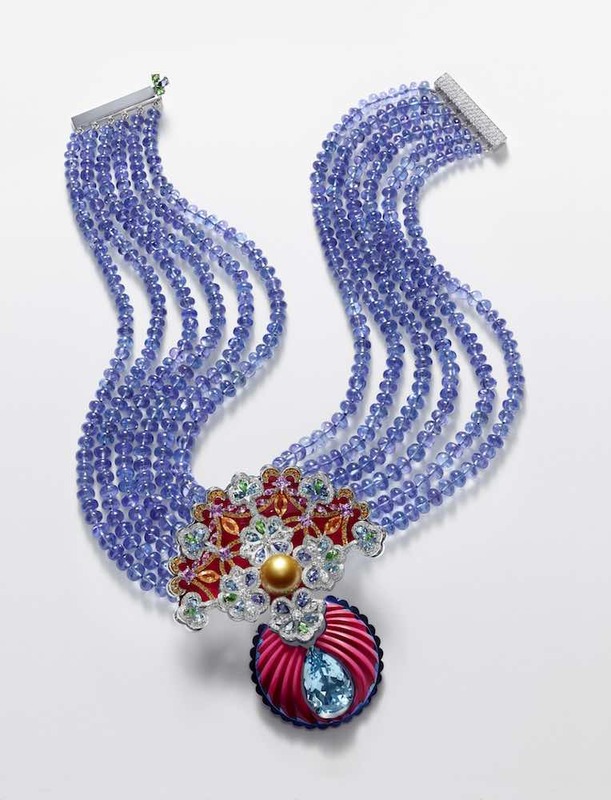 Gently held by rows of facetted tanzanite balls, a central red ceramic and titanium motif plays with a fascinating aquamarine, inviting observers to immerse themselves in its blue-tinged shimmer. Tanzanite also reigns supreme in other creations in the collection, such as an imposing bracelet comprising several rows of facetted tanzanites and a central motif dominated by a majestic, iridescent and mysterious black opal. A subtle nudge slides the opal to reveal its secret: an ornate watch dial like a window onto an Eastern sky worthy of the finest Chinese lacquers, composed of pink mother-of-pearl and chalcedony.